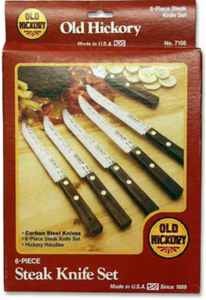 Old Hickory Kitchen Knives have been favorites in the kitchen since 1899 and for good reason. They have tempered carbon steel tool blades that take and hold an edge and brass riveted hickory wood handles that last virtually forever. Blades should be oiled occasionally and should not be put in the dishwasher.